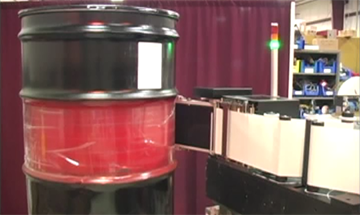 Finally, a reliable solution for in-line pail and drum labeling. 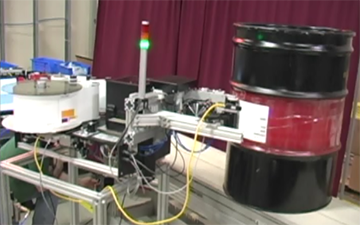 A unique wipe-on label applicator arm is incorporated into either a FOX I V print and apply unit or label applicator to precisely label cylindrical containers such as pails and drums. The belt driven applicator arm follows the circumference of the pail or drum to securely wipe on the label. The system shown incorporates a FOX IV label applicator in a horizontal position to apply a pre-printed GHS drum label. This type of pail/drum labeling system can apply a larger label such as a 6″ wide or 8.5″ wide label to ensure complete, readable information. System options include mounting, label verification and scanning.